I’ve never been able to get a picture of an American Gold Finch in my backyard. I’ve seen them, but they never stay in one place long enough to focus. 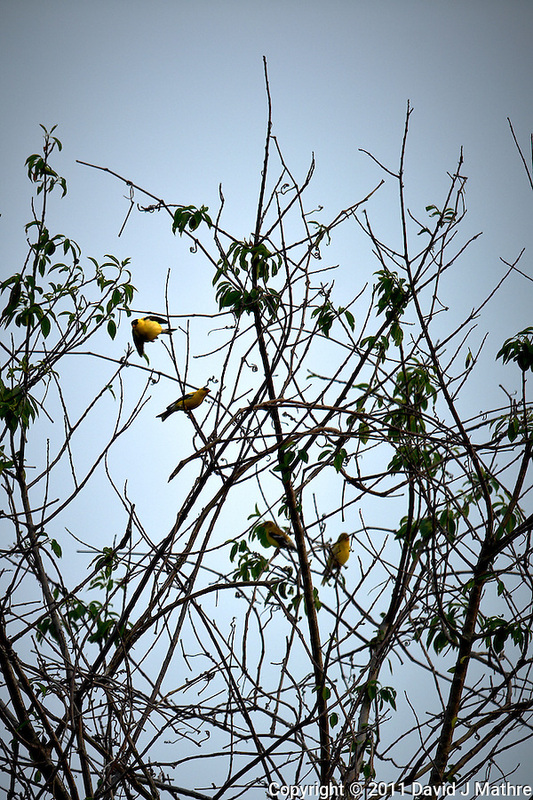 Now that I have the adapter to have the new telephoto lens on a Gitzo Tripod with a Wimbly mount, I was able to get this image of four American Gold Finches. They were in the top of a tree approximately 150 feet from my deck. Four American Gold Finches Waiting For Sunset. Outdoor Nature in New Jersey. Image taken with a Nikon D3s and 600 mm f/4 lens (ISO 200, 600 mm, f/4.5 1/1000 sec). Raw image processed with Capture One Pro, Focus Magic, and Photoshop CS5.